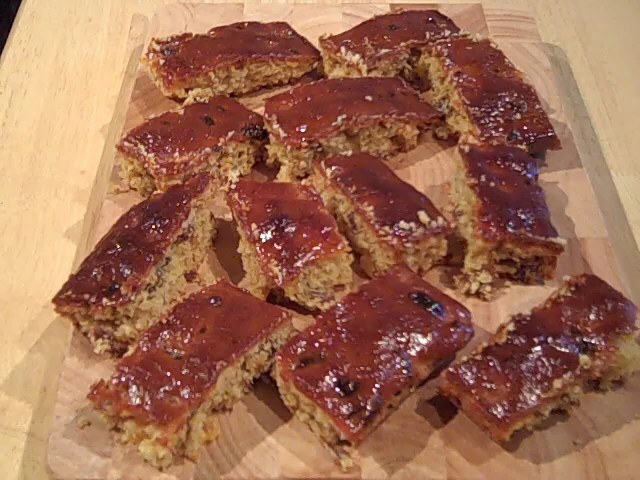 Make sure you measure the marmalade carefully – too much will make the cake stodgy. Preheat oven to 180C/gas mark 4. Line a 33 by 23cm shallow tin with baking parchment. Sift the flour, baking powder and mixed spice into a large bowl. Stir in the sultanas and apricots. Add the butter, sugar, orange zest, eggs and 75g marmalade. Beat together until evenly mixed. Put the mixture into the tin and level the top. Bake for 45 – 50 minutes or until the middle of the cake springs back when lightly pressed. Heat 3 Tbsp of marmalade carefully in the microwave, 10 seconds at a time is a good way to go. Brush melted marmalade on top of the hot cake.